Aside from the stretches of human-altered agricultural land filling much of the Imperial Valley, most of Imperial County is within the Sonoran Desert. The signature ocotillo is especially common west of the Imperial Valley. But not all of Imperial County is straight desert. A tiny corner in the extreme southwest belongs to the Californian floristic province. Herea number of species more typical of San Diego County’smountains, such as California juniper, red shank, and manzanita, enter the county. The San Diego Natural History Museum Herbarium staff, with Judy Gibson taking the lead, is currently compiling the first ever checklist for Imperial County, and this will almost certainly encourage botanists to take a closer look at the county. The authors of the Imperial County checklist will tell you that the flora of Imperial County is still poorly known. A search of the Consortium of California Herbaria website will yield over 200,000 herbarium specimens from San Diego County. A similar search of Imperial County will yield only 20,400 specimens. In the years of collections, there is only one, 1943, deep into the Second World War, were more plants were collected in Imperial County during a year than in San Diego. In some recent years, thanks to the SD Natural History Museum’s Plant Atlas, nearly as many plants have been collected in a single year as had been collected total previously in Imperial County. While the rare plants of Imperial County get more attention than their more common counterparts, we also know a good deal less about those than we should, and there are probably more than a few yet to be found. A search of the CNPS Inventory of Rare and Endangered Plants yields 89 plants. Of these, only a single species, Peirson’s milk-vetch (Astragalus magdalenae var. peirsonii), is on the Federal Endangered Species list as Threatened and on the State list as Endangered. There are no endemic rare plants, those found only in Imperial County and nowhere else, though giant Spanish-needle (Palafoxia arida var. gigantea) comes close, with sites otherwise reported only for Sonora, Mexico. Typically, when searching the Inventory, there is almost always at least one rare plant listed for a county that isn’t really there. Imperial County seems to have more than usual. Of the 89 listed, 13 don’t appear to have solid sources. White pygmy-poppy (Canbya candida) is typical of these. 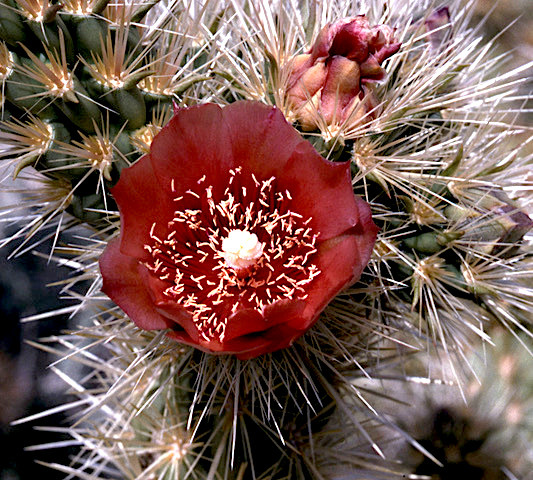 The plant is generally found in the western Mojave Desert and surrounding mountain ranges, and to my knowledge has never been found in the Sonoran Desert. Two others are included based on herbarium specimens, but the specimens are either tagged to the wrong county or the specimen is likely mis-identified. Therefore, the diversity of CNPS plants in Imperial County appears really to be 76. Of these, as you might expect, nearly all are California Rare Plant Rank (CRPR) 2B, rare and endangered in California but more common elsewhere. Indeed, nearly 60 of the 76 species are found in either Arizona and Baja California, Mexico, or both. Nearly 60 species (about 80 percent) are found in adjacent San Diego County, primarily at Anza-Borrego. Overall, most of Imperial County’s rare plants are found in the desert regions west and east of the Imperial Valley, on the Western Mesa and Yuha Desert, or the Chocolate and Palo Verde Mountains. As for species of limited distribution, the two stand-out areas are that little piece of the Californian Floristic Province in the extreme southwest and the Algodones Dunes. That southwest corner is extremely rugged and probably holds more rare plant surprises. Among the species found there are species that are otherwise largely known to occur only in Baja California. Some of the interesting rarities found there include southern jewel flower (Streptanthus campestris), a CRPR 1B.3 mustard; spearleaf (Matelea parvifolia), a rank 2B.3 member of the dogbane family; slender-leaved ipomopsis (Ipomopsis tenuifolia), a rank 2B.3 member of the phlox family; sticky geraea (Geraea viscida) a rank 2B.2 sunflower; and Wolf’s cholla (Cylindropuntia wolfii), a rank 4.3 cactus, and one of my favorites, Orcutt’s daisy (Xylorhiza orcuttii), that I first encountered in the rugged canyons along SR 78 just inside the Imperial County line. The Algodones Dunes form an impressive pile of sand. If you haven’t seen these great dunes personally, you are likely familiar with it as a stand-in for the dunes of the planet Tattoine in Star Wars. We can appreciate that Jabba the Hut’s barge floated over those dunes. In real life, they are a mecca for off road vehicle enthusiasts, which unfortunately does impact a suite of species that are nearly endemic to the dune system. Already mentioned is the state/federally listed Peirson’s milkvetch. It is found in a few other locations, but its stronghold is the Algodones Dunes. 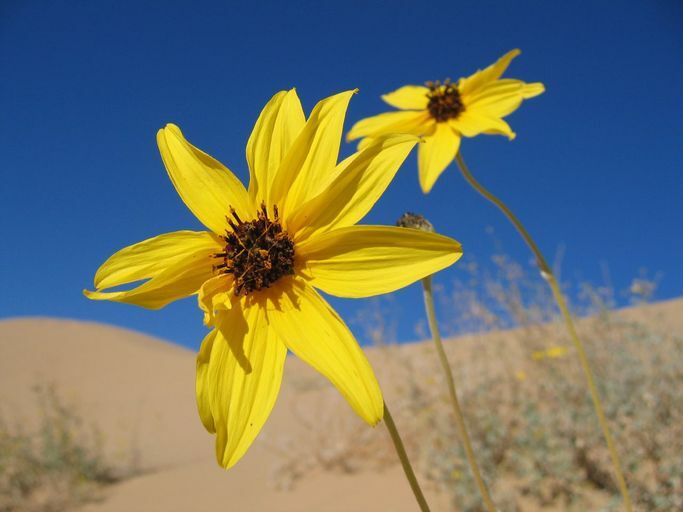 Other inhabitants of the dunes include Algodones Dunes sunflower (Helianthus niveus ssp.tephroides), CRPR 1B.2, and giant Spanish-needle, a CRPR 1B.3 sunflower. 2019 is a good year to consider Imperial County rare plants. We will likely get a checklist, and I encourage members to participate in one or more of the Imperial County field trips offered by CNPS-SD. NOTE: A chapter field trip to Painted Gorge & Mountain Palm Springs (ABSP) in Imperial County is scheduled for Sunday, February 10, 2019.